The classic carpet for a bungalow is a flat weave area rug like a Navajo or Mexican weave or a Kelim. This rugs can be very valuable or inexpensive vintage or souvenir products and both can have their place. A valuable rug should ALWAYS be cleaned by a professional but small and inexpensive pieces can be cleaned at home. I live in a loft with hardwood floors throughout so I have a very inexpensive vintage Kelim runner in my kitchen area to protect the floor. It is wool woven on a cotton weft, like many of these rugs and between my dog and my cooking, can get VERY dirty! It's a good choice for this kind of rough use as tightly woven Kelims were often made in the first place for practical, everyday use. They are readily available today for very little money. First I sweep the rug. This is a little bit hard on the wool fibers and an old fashioned rug beater would be better but I don't have a back yard. If you have an old fashioned shake out porch (old house often have a little balcony off the upper floor that really was there to shake out rugs, bedding etc), you have an ideal place to beat or shake your rug. Here you can better see the dog hair that you can also see in the first close up. Notice the pink tint from the wool fibers along with the grit and dog hair. I also vacuum the rug on both sides to get up the finer grit. Most vacuum cleaners have a flat rug setting that lifts heavy brushes to protect the flat surface. These brushes are harder on the rug surface than your mild sweeping so avoid using them. I actually WASH this small rug in my washing machine. The cotton and wool are essentially pre-shrunk from years of cleaning and blocking. Before you wash, however, it is important to test for color fastness. I have washed this rug many times and know that this nice red is actually and surprisingly quite staple so I'll show you a color test on some vintage embroidery. Old silk embroidery thread is famously non-colorfast. I rubbed this purple thread with a wet cotton swab. Note the lavender tint- this embroidery would be a disaster to wash. I spot clean the worst spots with an enzyme cleaner like Shout or OxyClean and cold water. These work best on protein stains which, since this is a kitchen rug, is mostly what I have. Do NOT leave this on more than a few minutes before washing or it may fade colors. Do not use bleach on wool - it will discolor and definitely weaken the fibers. Place in washer with a few small items to balance the load. Use a mild soap and nothing else. Run the washer on "large load" so the rug has plenty of room to slosh around and use cold water. Watch the washing and take the rug out right away. I purposely did not do this for this picture so you can see that in spite of the spin cycle wrinkles the rug will eventually be OK but your job will be easier if you avoid this. Block the rug. Having a friend help you pull on each end is helpful. Walk on it in bare feet and stretch. Wool has memory and the rug will flatten more as it dries. Do dry it flat if you can. Hanging over a rod as it dries can make a crease that is hard to get out. You CAN iron your rug. Spritz with a bit of water and use a pressing cloth. Over a few days of use the rug will flatten some more. Remember, valuable antiques should be cleaned by a professional carpet expert. 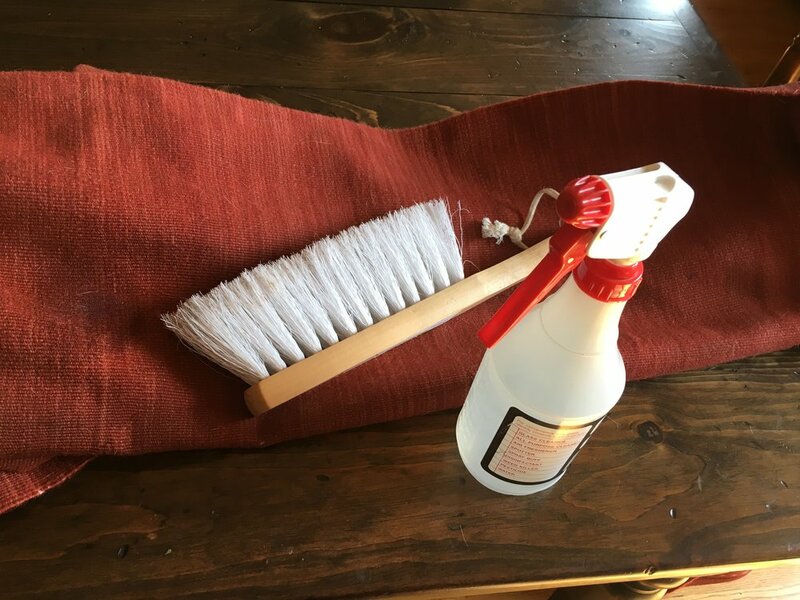 This kind of cleaning with gentle soap is easier on your everyday rugs than standard professional dry cleaning. Always check for color fastness!